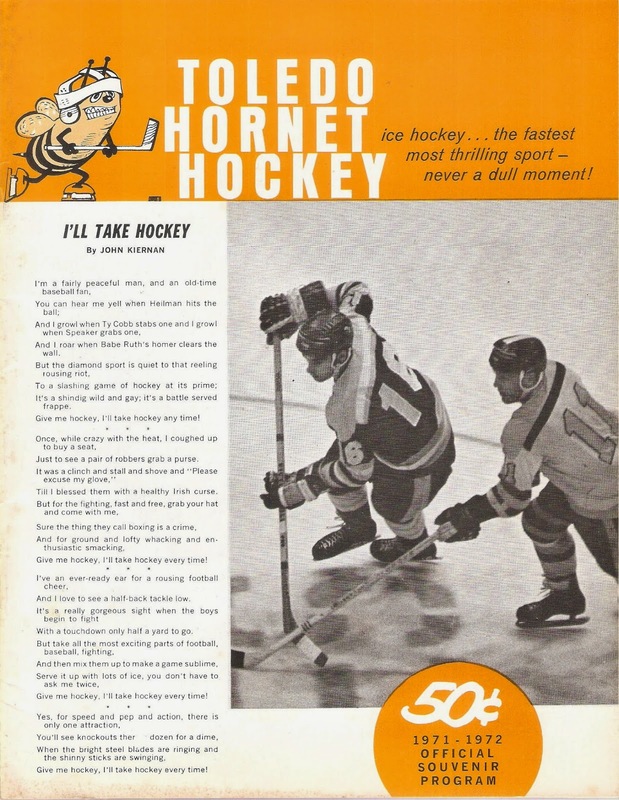 The Toledo Blades were renamed Hornets after the 1969-70 season. The Hornets were led by President/GM Paul Bright, and coached by Bill Needham. The Hornets four-year run is considered the low point of pro hockey in Toledo. While the Blades and Mercurys won 5 Turner Cups between them, the Hornets never made it past the first round. 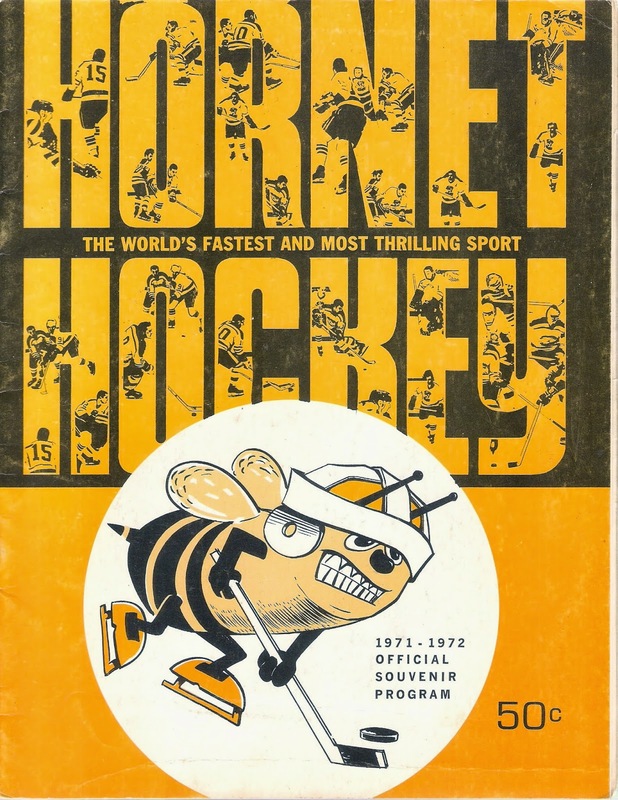 Finishing over .500 only once, the Hornets failed to capture the imagination of Toledo hockey fans, often playing in front of small crowds at the Sports Arena. The 1971-72 Hornets didn't improve much on the previous season, going a lackluster 26-46-0. That was good enough for dead last in the North Division, 15 points behind third place Flint and 48 behind division champ Muskegon. The Hornets had the third-worst offense in the league that year, scoring 270 goals. Needham's bunch were led by Jim Paterson, who had 46 goals and 86 points. Three other Hornets scored at least 20 goals. Toledo had all sorts of problems keeping the puck out of the net as well. They allowed a league-worst 371 goals that season, more than even the Columbus Golden Seals, the worst team in the league. The Hornets went through four different goaltenders that year, with local legend Glenn Ramsay taking the brunt of the abuse in net. Finishing dead last in the Northern Division eliminated the Hornets from playoff contention. Only the woeful Columbus Golden Seals (15-55-2) were worse than Toledo that year. Needham would be let go after the season in favor of Fred Burchell. For such a bad team, they had decent programs that year. Both programs have 34 pages, but only the second one has rosters. The first one posted was the first Hornets program I bought. I bought it at Gibraltar Trade Center in Mount Clemens. I bought the second one on eBay. Didn't pay too much for either. Ads include Coleco Pro Stars Hockey, Jeep and "Countrypolitan" WTOD 1560 AM. There are also pictures of Toledo Amateur Hockey teams. Of the two, I like the first one more, but not by much. Both are fine programs.